Cracks and Fracture consists of nine chapters in logical sequence. 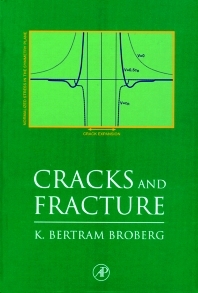 In two introductory chapters, physical processes in the vicinity of the crack edge are discussed and the fracture process is described. Chapter 3 develops general basic concepts and relations in crack mechanics, such as path independent integrals, stress intensity factors and energy flux into the crack edge region. Chapters 4-7 deal with elastostatic cracks, stationary or slowly moving elastic-plastic cracks, elastodynamic crack mechanics and elastoplastic aspects of fracture, including dynamic fracture mechanics. Appendices include general formulae, the basic theory of analytic functions, introduction to Laplace and Hankel transforms and description of certain basic relations, for instance for stress waves in solids. There is an extensive bibliography, containing references to both classical and recent work, and a comprehensive index. "The book presents a comprehensive and critical overview of the mechanics of cracks and fractures. 1) Fresh perspectives are given, highlighting central analytical methods and their applications as well as general theoretical and experimental results and their practical applications. 2) Fundamental concepts are introduced, considering the specific field of cracks and fracture as well as general mathematical models and analytic methods.